Do you know what we need right about now? Well, honestly, who knows what you need, but what I need on this December day filled with chores errands and a shocking lack of both snow and my husband, is to daydream myself back to the two days Nick and I spent in Venice this summer. Would you like a peek? View from the campanile tower on St. Mark's square. 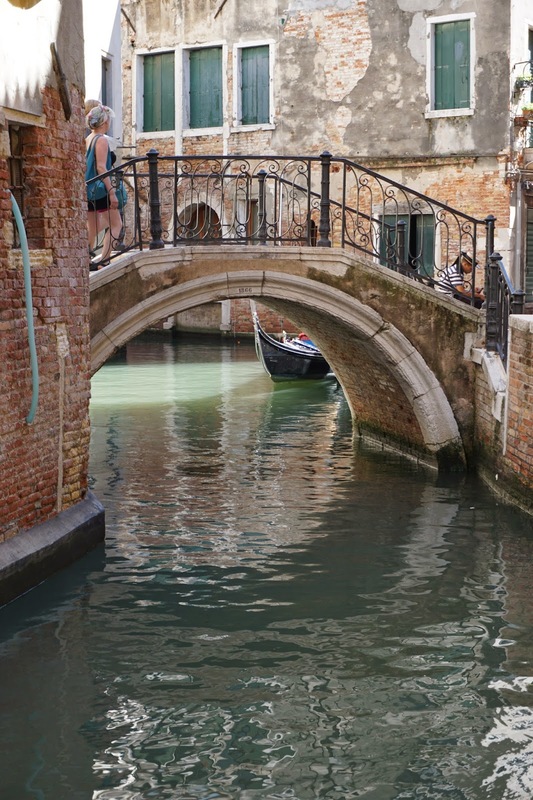 While our family was in Norway this summer, Nick and I managed to sneak away to Venice for a couple of days, just the two of us, as an early anniversary present to each other. Honestly, if it meant I could have Nick all to myself, I'd be happy to spend two days in a cardboard box, but seeing as we had the chance to go to one of the most romantic cities on earth, we went to Venice. And it was glorious. Dripping in sweat and romance. It's honestly hard to even begin to put in to words what our time in Venice was like. 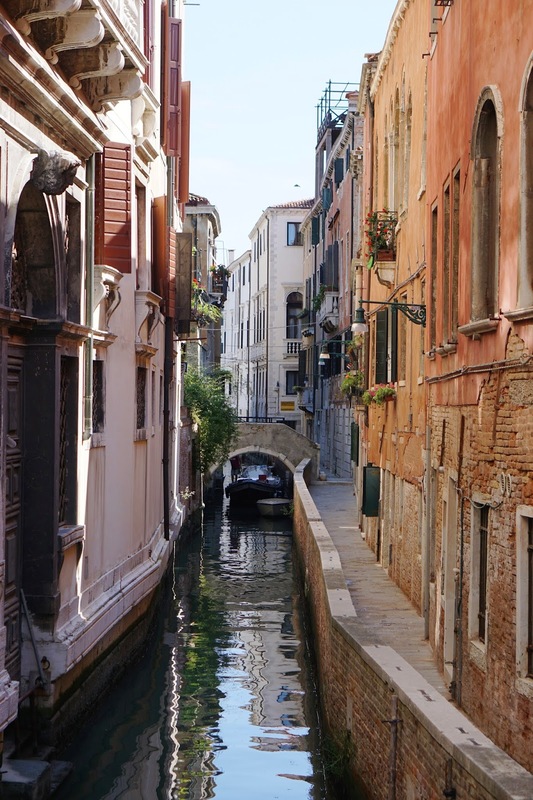 We wandered the narrow streets along the canals, often crossing the tiny bridges that hold the city together. 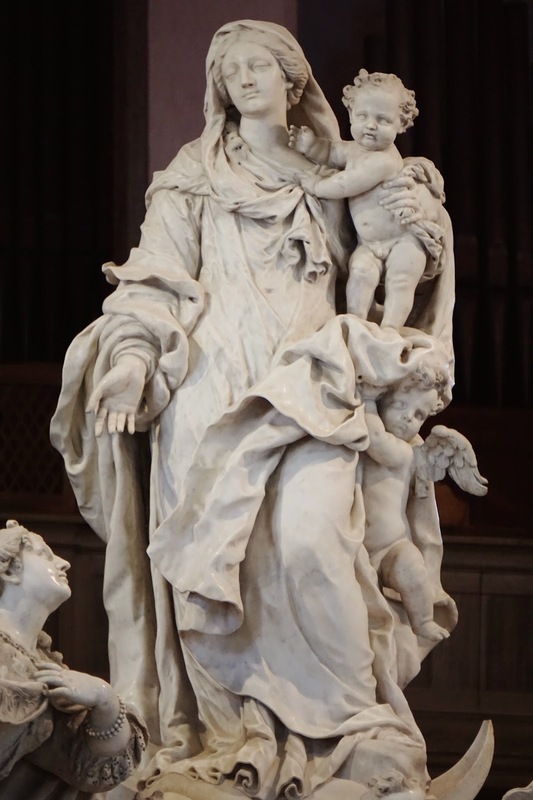 We visited churches I had been longing to see since my days as an art history student. We stayed in a gothic era bed and breakfast (which used to be a convent) on a sleepy side street just off the grand canal. We ate gelato so good I actually lost track of my surroundings for a moment. We rode water taxis to get around the city, because there just are no cars. We shopped for Venetian glass in countless tiny shops along the way. One night we ate at a small neighborhood osteria, the next night we had a four course meal looking out onto the lagoon. We took a private gondola ride around one of the neighborhood where real Venetians live, the sounds of families cooking dinner drifting down to the canal. On a narrow and quiet stretch of canal, our gondolier, Luca, sang us a Venetian lullaby. One night we wandered onto a square around the corner from our hotel, only to find people dancing the tango beneath the stars. It was so beautiful and perfect it was like being in another world. 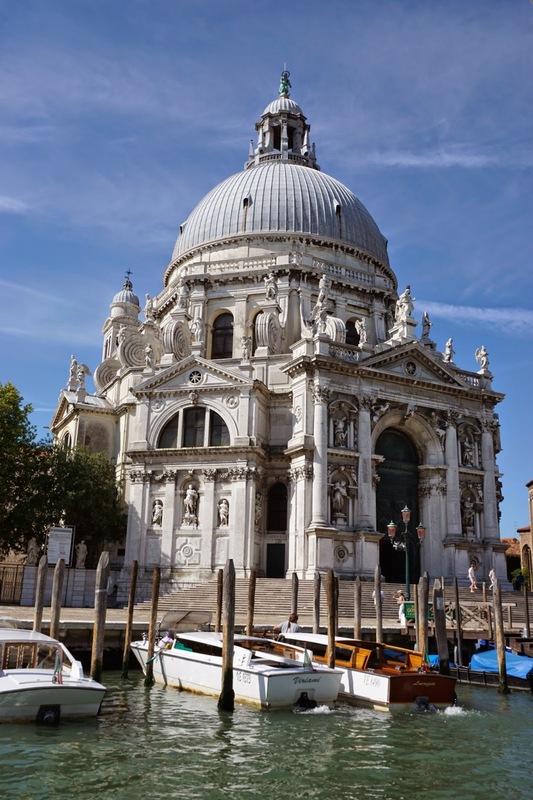 Santa Maria della Salute, one of the churches I have most wanted to visit since my college days. Built by the Venetian people as a prayer to the virgin Mary to protect them from the plague. Of course not everything was perfect and romantic and idyllic all the time. It was so hot and so humid that we were constantly dripping with sweat. We walked and walked until I thought my feet were going to fall off. Smoking is much more common and public than I am used to. Flower sellers were constantly accosting us and trying to get Nick to buy me roses. It was Venice in July, so there were the inevitable lines to wait it to get into some of the major sites. 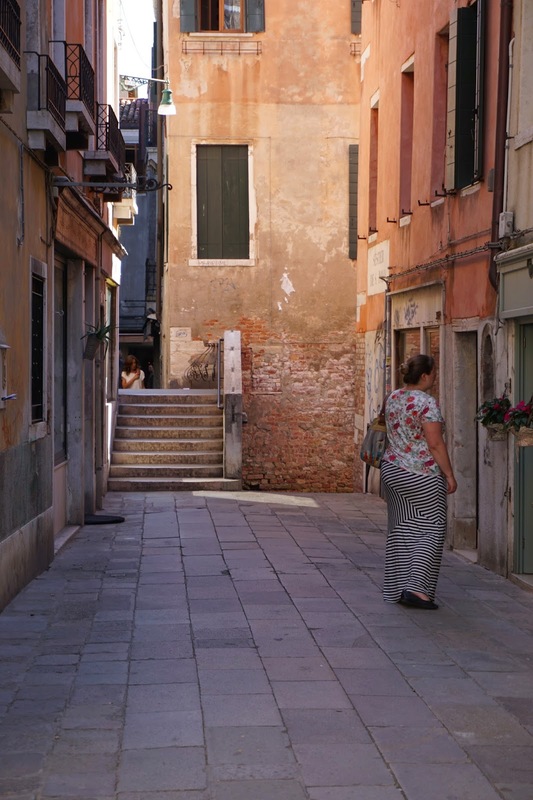 We met people who live a ten minute drive from our home, so when I entered St. Mark's basilica for the very first time, there was a woman telling me that she much preferred shopping at Walmart to Harmon's because their prices are better. But really and truly, none of that really mattered at all. We were just so happy to be there, and so ready to enjoy every moment that that is exactly what we did. I think at this point I'm just going to offer a deluge of photos so you can see for yourself. A girl can only swoon "it was glorious and perfect and wonderful" so many times before you want to sock her on the jaw. Window shopping on a quiet side street. Dinner at La Zucca on our first night. "Zucca" means pumpkin, and that it what their lighting was shaped like. A roof at St. Mark's square. On top of St. Mark's basilica. Can you tell that we were pretty happy to be there? The winged lion - the symbol of St. Mark and of Venice. The columns of San Marco and San Theodoro. On our last morning we stopped at an open air market. We couldn't bring any of the produce home with us, so we just took pictures instead. 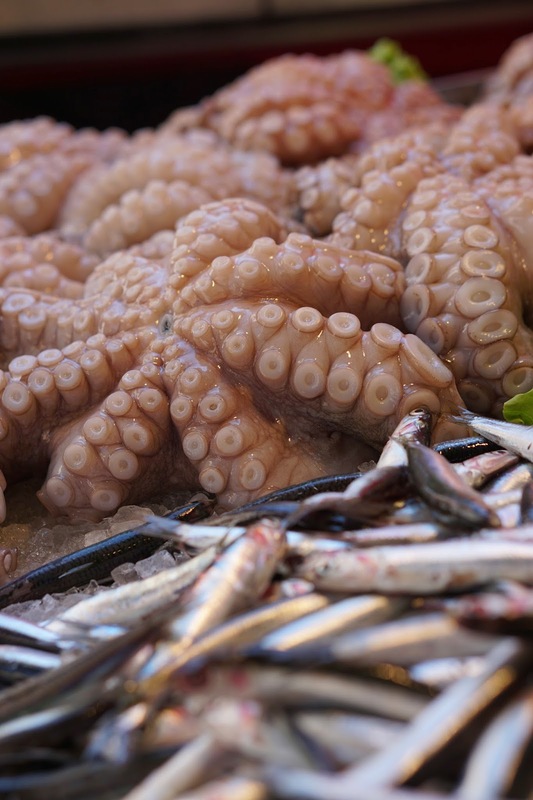 And some pretty awesome seafood. These narrow little streets and tiny bridges were everywhere. Enjoying the meal of a lifetime steps from the lagoon. Our dinner by the lagoon. My fish course (top left) was so pretty that I was actually brought to tears. "They did this for me?" Happily snarfling one last pastry before heading home again. The only hard part of going to Venice was leaving it, to be honest. We arrived by boat and left by bus, so I was really in heaven right until we got to the area by the bus and train station, which was a rude awakening and return to the real world. Venice itself is quite peaceful and so beautiful that seeing a parking lot and a bus depot for the first time in 48 hours is a real letdown. It was really just as well that I had two beautiful children waiting at home for me to come back and celebrate my birthday with them, otherwise I might just have turned around and gone native. But once we were on the bus and on our way home, we got a drive through the Italian countryside, which made up for a lot. Venice, you were a dream. I hope to be back again some day. Until then, arrivederci, bella. Looks so beautiful! Nice picture-taking skills. Um, so the picture of you in that teal shirt? You are absolutely stunning. Great pictures - I would like to paint some of them! !